For more than decade, Brooklyn-based artist Chitra Ganesh (American, born 1975) has mined the iconography of mythology, literature, and popular culture to bring to light feminist and queer narratives. 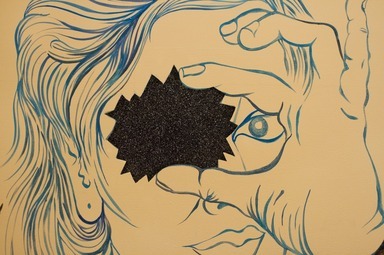 Employing a variety of media —including charcoal drawings, digital collages, films, web projects, photographs, and wall murals—Ganesh's evocative and surreal juxtapositions rework shared cultural fantasies to allow for new readings of the past and alternate visions of the future. 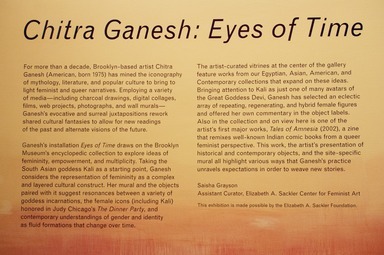 Ganesh's installation Eyes of Time draws on the Brooklyn Museum's encyclopedic collection to explore ideas of femininity, empowerment, and multiplicity. 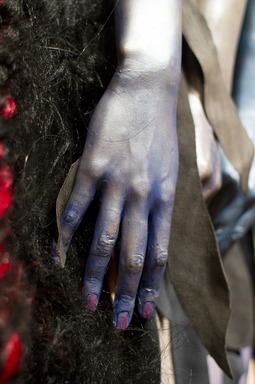 Taking the South Asian goddess Kali as a starting point, Ganesh considers the representation of femininity as a complex and layered cultural construct. 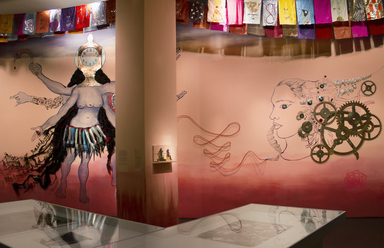 Her mural and the objects paired with it suggest resonances between a variety of goddess incarnations, the female icons (including Kali) honored in Judy Chicago's The Dinner Party, and contemporary understandings of gender and identity as fluid formations that change over time. The artist-curated vitrines at the center of the gallery feature works from our Egyptian, Asian, American, and Contemporary collections that expand on these ideas. Bringing attention to Kali as just one of many avatars of the Great Goddess Devi, Ganesh has an eclectic array of repeating, regenerating, and hybrid female figures and offered her own commentary in the object labels. Also in the collection and on view here is one of the artist's first major works, Tales of Amnesia (2002), a zine that remixes well-known Indian comic books from a queer feminist perspective. 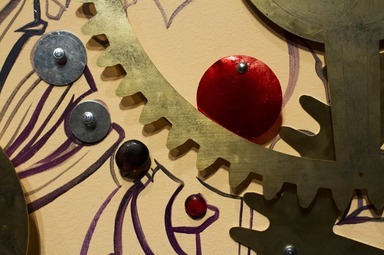 This work, the artist's presentation of historical and contemporary objects, and the site-specific mural all highlight various ways that Ganesh's practice unravels expectations in order to weave new stories. In Hinduism, the Great Goddess Devi takes many forms, with individually named avatars that proliferate and transform within devotional texts and practices. Kali is widely worshipped as one of these incarnations, along with other closely related goddesses such as Durga and Matangi, who are depicted in the traditional Indian painting in the nearby case. This array of coexisting characteristics and narratives offers a layered vision of female divinity, or shakti, that resists simplification or reduction. As the goddess of destruction and rebirth, Kali is closely associated with time and the inevitable changes it brings. Her adornments of skulls and arms, wild hair, bloodshot eyes, and black or blue skin have long defied typical portrayals of ideal femininity. Yet, her fearsome physical attributes belie her beloved status as both a destroyer of evil and a regenerative figure that allows life to spring from death. Ganesh’s work also draws inspiration from the migration of Kali and her forms to Buddhist iconography such as Tibetan devotional paintings, or thangkas, and Indonesian goddess imagery. 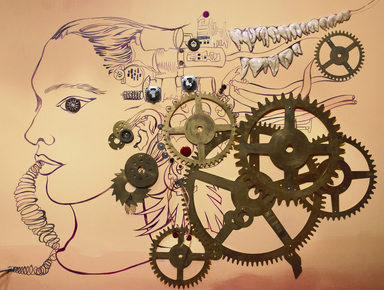 September 1, 2014 Chitra Ganesh: Eyes of Time, an exhibition featuring a multimedia, site-specific installation created by Brooklyn artist Chitra Ganesh and an artist-curated selection from the Brooklyn Museum collection, will be on view in the Herstory Gallery of the Brooklyn Museum’s Elizabeth A. Sackler Center for Feminist Art from December 12, 2014, through July 2015. 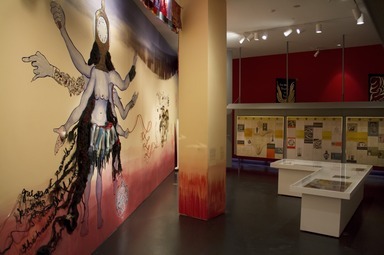 The presentation takes its inspiration in part from the Hindu goddess Kali, one of the figures honored with a place setting in Judy Chicago’s The Dinner Party, on permanent view in the adjacent gallery. 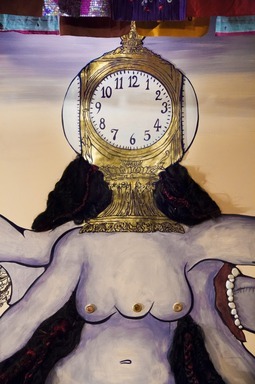 Responding to this unique context, Ganesh’s exhibition continues her ongoing exploration of iconic female characters, such as goddesses and female superheroes, and how they connect to contemporary feminist ideas and imagery. 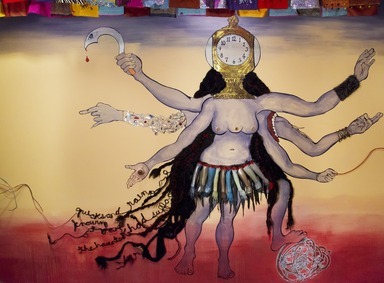 For more than a decade, Chitra Ganesh has explored mythic representations of femininity, sexuality, and power through a variety of media, from watercolors and charcoal drawings to digital collages, films, photographs, and text-based works, as well as numerous commissioned large-scale wall murals. 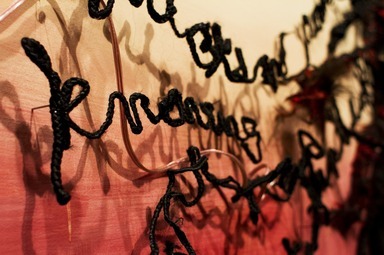 Her drawing-based practice often uses historical and literary texts as inspiration and points of departure to develop and pose alternate narratives and representations of the feminine. For her Brooklyn presentation, the artist will draw from historical and mythic tales that reveal the fierce Kali as one of the many avatars of feminine divinity, collectively represented by the Great Goddess Devi. As the goddess of destruction and rebirth, creation and salvation, Kali is the incarnation most closely associated with time and the inevitable changes it brings. Inspired by these mystical and visual attributes, Ganesh will incorporate materials gathered during her recent year-long stay in India to create a composition that fills the main wall of the Herstory Gallery and extends into space with three-dimensional sculptural elements. 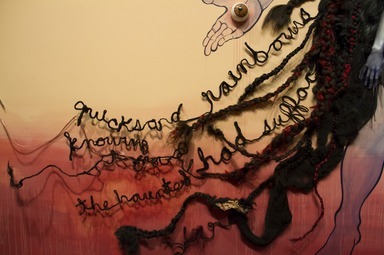 According to the artist, the work suggests “intersecting narratives that unravel across the space of the wall, forming new avatars that draw from Kali, as well as other figures from The Dinner Party, in order to think through femininity as a complex and multilayered representational project.” For this contemporary meditation on Kali, Ganesh will bring together her surreal compositional style with the fearsome physical embodiment of the multilimbed, three-eyed, wild-haired goddess who has long stood in contrast to norms of ideal femininity. She will also select works from the Brooklyn Museum’s encyclopedic collection that expand on the theme of female power and multiplicity. 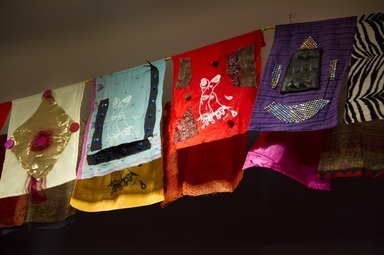 Throughout her career Ganesh has incorporated the vivid imagery of popular culture from India and the South Asian subcontinent into her fantastical feminist narratives. 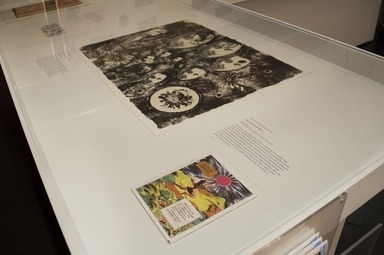 One of her first major works, Tales of Amnesia (2002), a zine inspired by Indian comic books, appeared in the Brooklyn Museum’s 2004 exhibition Open House: Working in Brooklyn and is now in the Brooklyn Museum’s Brooklyn Artists’ Book Collection. During the course of the exhibition, a version of the zine will be made available so visitors can read the publication from beginning to end. 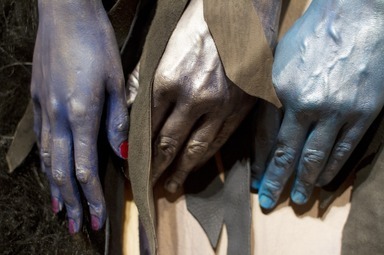 Ganesh was born and raised in Brooklyn, where she currently lives and works. A graduate of Brown University, with a B.A. in Comparative Literature and Art-Semiotics, she attended the Skowhegan School of Painting and Sculpture and was awarded an M.F.A. in painting from Columbia University. Her work has been widely exhibited locally and internationally, including recent solo exhibitions at Göteborgs Konsthall, Sweden, and the Andy Warhol Museum, Pittsburgh, and is represented in numerous public collections, including the Baltimore Museum of Art; Gwangju Art Museum, South Korea; Philadelphia Museum of Art; Museum of Modern Art, New York; Queens Museum of Art; San Francisco Museum of Modern Art; and Whitney Museum of American Art. 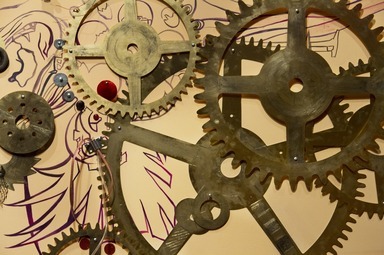 Ganesh is the recipient of numerous grants and residencies, including awards from the New York Foundation for the Arts, Printed Matter, the Joan Mitchell Foundation Painters and Sculptors Grant Program, and the John Simon Guggenheim Memorial Foundation Fellowship in the Creative Arts. 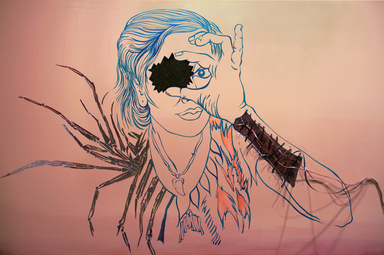 She and collaborator Miriam Ghani were Artists-in-Residence at A/P/A Institute at New York University last year with their project Index of the Disappeared (2004–), and Ganesh is currently serving as the first Kirloskar Visiting Scholar in Painting at the Rhode Island School of Design. 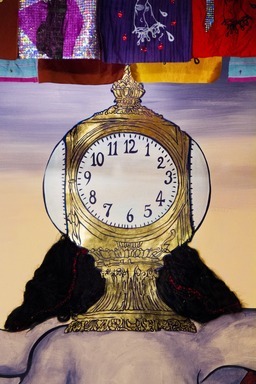 Chitra Ganesh: Eyes of Time is organized by Saisha Grayson, Assistant Curator, Elizabeth A. Sackler Center for Feminist Art, and is made possible with support from the Elizabeth A. Sackler Foundation. 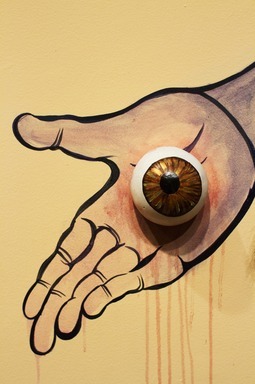 The Herstory Gallery in the Elizabeth A. Sackler Center for Feminist Art presents exhibitions related to Judy Chicago’s The Dinner Party, an iconic work celebrating the achievements of women throughout history, which is on long-term view in the adjacent gallery. The principal component of The Dinner Party is a massive ceremonial banquet arranged in the shape of an open triangle—a symbol of equality—measuring forty- eight feet on each side with a total of thirty-nine place settings, one of which is dedicated to Kali. The settings are composed of richly embroidered runners reflecting the era and contributions of each honoree, china-painted porcelain plates whose raised central motifs are based on butterfly and vulvar forms, and larger-than-life glazed porcelain chalices and utensils. Another 999 names are gilded on the Heritage Floor below.